So now faith, hope, and love abide, these three; but the greatest of these is love. 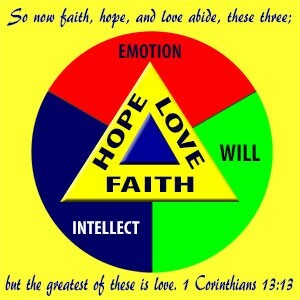 This diagram and the lesson which follows show how faith, hope, and love relate to the mind (intellect), will, and emotion of man – which in turn corresponds with the soul. When we read that God created man in His own image (Genesis 1:27) it does not refer to merely a physical representation, but the character and attributes of God. As God Himself is the Father, the Son, and the Holy Spirit, so man is also a tri-part being: body, soul, and spirit. Even as God is more complex than we can imagine, man is also more complex. The soul (or sometimes called the inner man) is in turn tri-part: mind (intellect), will, and emotion. While the image of God in man may have suffered tarnish and decay it is still there in every man (person). It is often taught that faith is ‘simply believing’. However, saving faith is more than just accepting the gospel as true (purely intellectual). It is a function of the heart which involves also the will of man (hope) and emotion (love). May this short study help us to understand what it means to be “sanctified wholly”. Faithless men often accuse believers of having thrown away reason in favor of faith. This could not be farther from the truth. In fact, it is more reasonable to believe the Word of God than to reject it! It has been rightly said that it takes more faith to be an atheist than it does to be a Christian. All of creation is stamped with the fingerprint of an intelligent creator. He is the origin of intelligence and has included that in His image which He stamped upon man. Reason and intelligence set man apart from all the rest of God’s creation. This has given man the inherent ability to know. Whether by information gathered through his senses or by revelation (God’s Word) man can come to know that “God is, and that He is a rewarder of those that diligently seek him” (Hebrews 11:6). It is not knowing about God, but knowing Him (Philippians 3:10). The ability to choose and the courage to strive toward a goal are both functions of the “will”. The will of man is affected by both information (MIND), and desire (EMOTION) and can reciprocate by affecting them through choice. Even if the mind of man may be convinced of the truth of the gospel, true faith is also an act of the will. There is an old saying, “a man convinced against his will is of the same mind still.” Even so, the will of man alone is not enough to save (John 1:13). The New Birth is the work of God. God’s love for man is not because of what He knows about man (intellect), but in spite of it. Love for man is the result of His desire (WILL) not man’s performance. God experiences joy and sorrow as well as anger and peace. Man experiences these as well. Jesus was asked which is the greatest commandment (Matthew 22:36-40). His response was the law and the prophets hang on two commandments: 1) Love the Lord thy God with all your heart, and 2) Love your neighbor as yourself. We now turn our attention to these three words: Faith, Hope, and Love. We will observe how they related to each other and to the heart of man (the inner man). Faith is listed first. Contrary to the idea of many unbelievers faith is not the opposite of reason. In fact, faith is based upon reason and information (intellect). Paul says that “faith comes by hearing, and hearing by the Word of God” (Romans 10:17 and Galatians 3:2 & 5). The writer to the Hebrews devotes a large section on faith. Faith in God is believing and acting upon the promises of God (the Word of God). It is never “blind trust”, but based upon a long history of God’s faithfulness to His people. So then, the basis of faith is primarily intellect and will. The Gaither’s used to sing a song titled “God Said It, I Believe It, and that settles it!” There are many like Agrippa that may be intellectually convinced (Acts 26:28) but reject the truth. Others are like the man who asked Jesus to heal his daughter. He had the desire (will) without the intellect, yet he prayed “Lord I believe, help thou my unbelief” (Mark 9:24). The Biblical term hope does not include any idea of uncertainty or wishful thinking. Hope in the Biblical sense is to anticipate something with surety and with joyful anticipation. Hope is based upon facts (intellect) and results in a feeling of expectation (emotion). If one truly believes then they cannot help but hope. For some it is the expectation of life in the presence of the Savior upon their death to this world. For others of us it is the expectation of the “Glorious Appearing” (the second coming) of our Great God and Savior before our life on earth is done (Titus 2:13). Love has at least two components, 1) Affection (that feeling of love that escapes full definition) and 2) Commitment. The Love of God (agape love) is well defined as “God’s Loyal Love”. It is more than affection, though that is certainly a part of love. Love is an expression of the will of man. Affection may draw a young couple to the wedding alter, but it takes a lifetime of commitment to keep them married. The disciple whom the Lord loved (the description that he gives himself – John 20:2, 21:7 & 20) wrote “We love Him because He first loved us” (1 John 4:19). His kindness draws us to repentance (Romans 2:4) but to respond to that love is an act of the will. Faith is a function of both knowing and committing. To know without committing (resting upon the Truth) is not belief. Hence the related terms believing and trusting weigh heavily upon the will. Hope is based on intellect but with joyful anticipation. To know the Truth without it affecting your emotions is not normal. Any parent knows that you do not give a child good news of a future event too soon. Otherwise, they will burst under the excitement of waiting for “it” to come. Love is both affection and commitment. To truly love God is not just to be drawn by His Goodness, but to desire what He desires and to want what He wants. Why is it “the greatest”? Our intellect and wisdom do not impress God. But when we love we are most like Him who “loved me and gave Himself for me” (Galatians 2:20). It is not our love for Him, but His love for us (1 John 4:10). He demonstrated His own love for us in giving His Son (Romans 5:8). When we love God and love our brothers, we represent to the world what He is like who said “by this shall all men know that you are my disciples, because you love one another” (John 13:35).